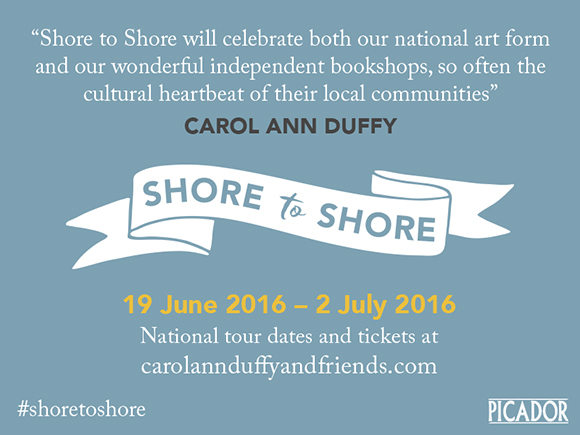 Poetry readings from Carol Ann Duffy, Gillian Clarke, Jackie Kay and Imtiaz Dharker recorded live at Hope Park & Martyrs Church, St Andrews as part of the Shore to Shore poetry tour. Carol Ann Duffy's celebration of poetry and community recorded live at Hope Park & Martyrs Church, St Andrews on Saturday 2nd July 2016. Featuring poetry readings from Carol Ann Duffy, Gillian Clarke, Imtiaz Dharker, Jackie Kay and music from John Sampson. Off the Shelf, Carol Ann Duffy's specially commissioned poetry anthology in celebration of books and bookshops is available now from all good independent bookshops.